The use of external GPUs (or eGPUs) has been making waves for a multitude of computer enthusiasts and content creators alike. By attaching an external graphics card to your Mac, you can achieve improved editing efficiency and rendering performance through the additionally provided GPU-acceleration. Unfortunately, traditional methods of using an eGPU with a laptop such as a MacBook or MacBook Pro requires you to output your screen to an external monitor. This may act as an inconvenience for those creative professionals who either don’t have an external monitor on hand or if you’re someone who prefers to edit solely by using your Mac’s built-in display. Luckily, an open-source computer script is now available to remedy the situation. Set-eGPU is a Terminal-based code that allows your computer to take advantage of your eGPU without having to output to an external monitor. The use of set-eGPU is further explained by Jeff Benjamin of 9to5Mac in the video below. To get started, first launch the application Terminal, which is included with all Macs. Secondly, open your web browser and go to the following URL. 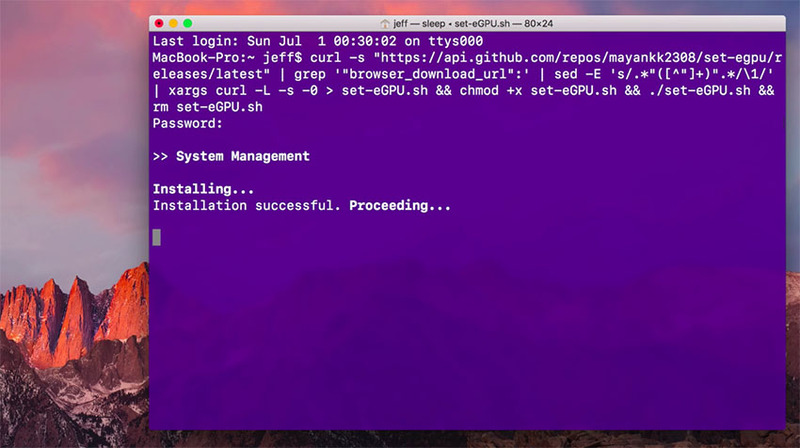 From there, under the Usage section, copy and paste the Install set-eGPU.sh code into Terminal. After pressing enter, Terminal will prompt you to enter your password. By proceeding further, an interface for set-eGPU will appear. From the menu, you will have access to multiple functions. 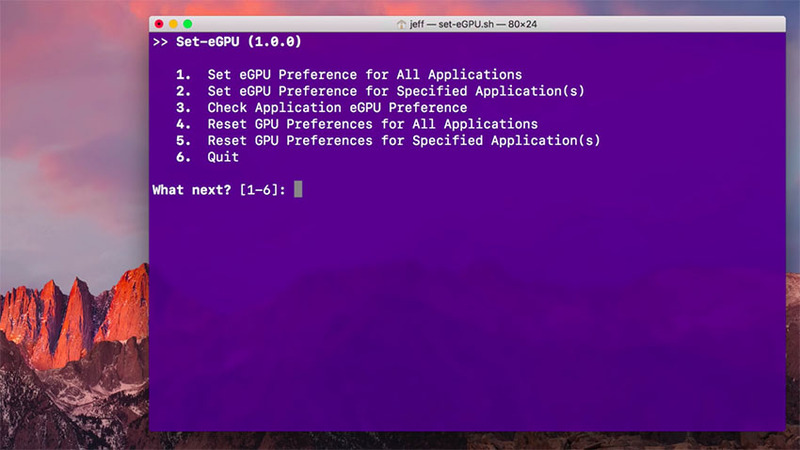 Typing 1 will enable all applications in your system to take advantage of GPU-acceleration through your eGPU. On the other hand, typing 4 will reset all the GPU settings for all applications. Alternatively, if you want to specify which applications take advantage of GPU-Acceleration, you can type in 2 to set the eGPU preference accordingly. For example, you can set the eGPU preference to only apply to your video editing application, such as Final Cut Pro. If you want to reset the GPU Preferences for specific applications, you can press 5. Needless to say, the performance benefits gained from going through this easy-to-follow procedure are a real no-brainer. 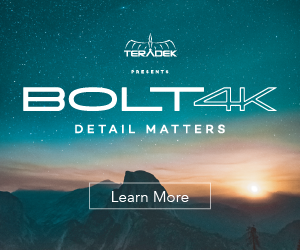 Looking at the benchmarks, utilizing the eGPU resulted in much faster rendering times across the board compared to the integrated Intel Iris graphics – even when outputting to different codecs and degrees of quality. Even synthetic benchmarks such as Engine Heaven and Valley OpenGL show massive performance increases when the eGPU is utilized. Obviously, this powerful software solution can be extremely beneficial to content creators who find themselves using a lower-end Mac laptop, or for those who simply want increased graphics performance without having to use an external monitor, it’s worth taking the time to configure set-eGPU to run on their machine. While the script may take some time to understand and execute, it will be well worth the time saved from reduced render times.